Larger, heavier and more broad-winged than other harriers; wavering low glides on raised wings when hunting; otherwise wings with bend at carpals. 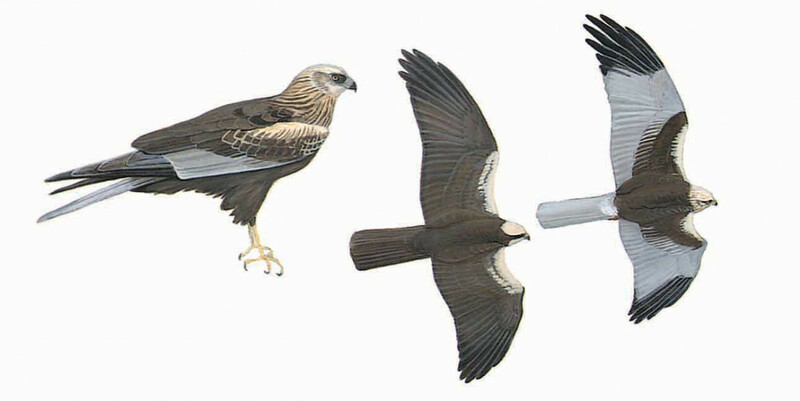 Male tri-coloured on upperwing (silver-grey, brown and black); uppertail silver-grey; under surface white but wing-tip black and rear-body red-brown, latter separating it from high-flying male Hen Harrier. Female dark brown, tail rusty-brown, crown, throat and breast-spot yellow-white. Juvenile blackish brown usually with rusty yellow on head. Immature male has dirty grey areas on upperwing and tail, rusty brown body and underwing-coverts, and more extensive black wing-tips than adult. Rare dark morph solidly blackish brown but adult male has flight-feathers below distinctly white at base. Display flight comprises steep up and down swoops with slow, deep wing-beats, performed at great height.